All the coffee and chocolate to satisfy and endulge. Send them a gift that is sure to keep them awake and satisfy all of their gourmet desires. Send them one of our Coffee and Chocolates Gift Baskets. 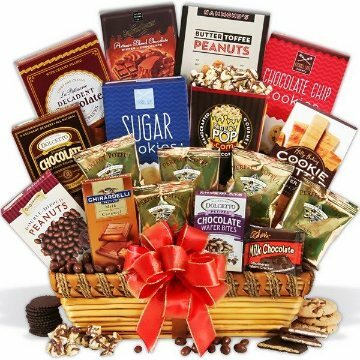 The large version Coffee and Chocolates gift basket contains numerous gourmet chocolate and coffee-themed ingredients, like Chocolate Covered Espresso Beans, Espresso Cookie Brittle, Café Mocha Wafer Rolls, and more including a generous assortment of gourmet coffee. For an even bigger impression select the Deluxe Coffee and Chocolate Gift Basket or the Premium Coffee and Chocolate Gift Basket. This basket is perfect for birthdays, holidays, anniversaries and more. This gift basket includes the following: Three Perfect Potfuls Assorted Gourmet Coffees, Dark Chocolate Smothered Graham - 1.02 oz., Chocolate Espresso Beans by Marich - 1.76 oz., Butter Rich Cookie Brittle - 6 oz., Mocha Wafer Roll Petites - 5 oz., Dark & Truffle Filled Squares - 5.32 oz., Chocolate Chip Cookies - 4 oz., Chocolate Wafer Petites - .7 oz. Deluxe basket includes the following: (Shown) Butter Rich Cookie Brittle - 6 oz., Chocolate Crepes - 4.2 oz., Chocolate Wafer Rolls - 4.4 oz., Chocolate Dipped Chocolate Moravian Cookies - 8 oz., Five Perfect Potfuls Assorted Gourmet Coffees - 1.5 oz., Milk Chocolate Caramel Bar - 3.5 oz., Butter Toffee Peanuts - 5 oz., Double Dipped Peanuts - 3 oz., Milk Chocolate Smothered Graham - 1.02 oz., Milk Chocolate Drizzled Popcorn - Approx. 2 cups, Sugar Cookies - 4 oz., Chocolate Chip Cookies - 4 oz., Chocolate Wafer Petites - .7 oz.